"When fluoridation is seen to cause delayed tooth eruption, what else is it doing to our bodies?" This is incredible, our health agencies rather poison infants and those allergic/sensitive to fluoride regardless of all the other health effects that are affecting so many, all for an erroneous less than one whole cavity reduction! Listen to Health Canada's Chief Dental Officer (Dr. Peter Cooney) below. The following news release by Canadians Opposed to Fluoridation ~ Canadiens Oppos�s � la Fluoration clearly demonstrates how this minuscule cavity reduction can be explained by delayed tooth eruption. Surely you are going to see some more caries in those with erupted teeth then those whose teeth are still erupting? Now we have even more evidence that what little, and I mean little, benefit the proponents bandy around may not even exist... The deeper and more important question remains - why fluoride delays teeth eruption, failure to drive is directly linked to the thyroid and given fluoride's propensity to suppress thyroid function - obviously this is very serious! "This isn't just about teeth any longer. When fluoridation is seen to cause delayed tooth eruption, what else is it doing to our bodies? ", says Robert J. Fleming, President of Canadians Opposed to Fluoridation ~ Canadiens Oppos�s � la Fluoration. "Public health needs to brush up on the latest research. Repeating opinions, endorsements and name-dropping will no longer cut it." Toronto, April 4, 2011 � At a meeting held by the Toronto Board of Health to review and vote on the Toronto Medical Officer's Fluoridation Report today, COF-COF President Robert J. Fleming calls on the city of Toronto to hold an open and transparent public hearing on water fluoridation's continuance. "After all, Toronto has been fluoridating since 1963, and if elected decision makers are genuinely interested in public process, informed consent, healthy debate, and science concerning fluoridation, such a hearing is a fair way to proceed." According to Statistics Canada drinking fluoridated water over one's lifetime results in less than one whole cavity reduction per person. What's more, worldwide research demonstrates this minuscule cavity reduction can be explained by delayed tooth eruption, caused by fluoridated water. In fact, the most recent research finds fluoridation delays tooth eruption by as much as two years, thereby accounting for all of fluoridation's claimed benefit. The fewer teeth erupted at any given age, the fewer tooth surfaces exposed to the mouth's acid decay. Yet as COF-COF President Robert J. Fleming points out in his response to the Toronto Medical Officer's Fluoridation Report being tabled and voted upon by Toronto's Board of Health this afternoon, the report ignores this statistic and other key research showing a lack of evidence that fluoridation actually fights cavities. "In other words fluoridation doesn't really work the way we were told, but is actually due to delayed tooth eruption. Such findings should topple water fluoridation practice once and for all", says Fleming. "Why put industrial waste fluoridation, and its trace co-contaminates arsenic, lead, mercury and radionuclides into otherwise clean drinking water, when the decay reduction is so minuscule, and actually due to delayed tooth eruption?" says Fleming. "We are deeply disappointed with the errors and omissions of this report. Rather than a serious investigation of fluoridation and its effects, Toronto's Medical Officer has produced yet another cursory response. Toronto's Board of Health should refuse to accept such an unprofessional report." If water fluoridation doesn't actually protect the tooth enamel like we were told, water fluoridation deserves serious rethinking", says Fleming. Our team of volunteers, experts and professionals want and hope for you to become fully informed regarding water fluoridation. As I began to learn, I was astounded and moved to share openly what we had all come to realize. That science supporting water fluoridation remains weak throughout six-decades of fluoridating, while science pointing to fluoridation health and environmental harms continues to emerge. Politics and saving face seem to be the main stumbling blocks to releasing scientific truth about water fluoridation; science clearly indicating it's time to end this outdated practice. Robert J. Fleming is the current President of Canadians Opposed to Fluoridation ~ Canadiens Oppos�s � la Fluoration (COF-COF). He is also the Executive Director of www.WaterlooWatch.com, which lead the successful charge to end fluoridation in Waterloo, Ontario. Fleming debated Health Canada's Chief Dental Officer (Dr. Peter Cooney) in Waterloo, mere days before citizens voted to shut-off Waterloo's 45 year practice of water fluoridation. Canadians Opposed to Fluoridation ~ Canadiens Oppos�s � la Fluoration have it on record from Statistics Canada and Health Canada that drinking fluoridated water over one's lifetime amounts to less than one whole cavity reduction per person. An audio recording provided by COF-COF (attached here) has Cooney initially dispelling such miniscule fluoridation benefit, but Cooney soon finds himself trapped by recently cited Statistics Canada research proving Fleming's claim to be true. Ultimately, Cooney agrees water fluoridation results in less than one whole cavity reduction regardless of the person's age. Critics of fluoridation have long argued that the tiny reduction in tooth decay celebrated by pro-fluoridationists is really due to delay in tooth eruption which is observed in fluoridated communities. The fewer teeth erupted at any given age, the fewer tooth surfaces exposed to the mouth's acid decay. Delayed eruption of just one year would account for these small decay reductions claimed in the US, Australian and New Zealand studies published since 1990 (Brunelle and Carlos, 1990; Slade et al., 1996; Spencer et al., 1996; Armfield et al., 2009; Armfield, 2010). These studies have found reductions ranging from 0.12 of one permanent tooth surface saved (Spencer et al., 1996) to 0.6 of one permanent tooth surface saved (Brunelle and Carlos, 1990) out of approximately 100 tooth surfaces in a child's mouth. In 1999, the National Health and Medical Research Council, Australia's peak Medical Research body, noted "evidence exists that tooth eruption is delayed in fluoridated areas. It has been suggested that a proper comparison of caries rates should involve children one year older in fluoridated areas than in non-fluoridated areas." In 2000, the York Review (the most comprehensive review of the evidence on fluoridation and tooth decay published at that time) pointed out that none of the studies they reviewed had controlled for "the number of erupted teeth per child" (McDonagh et al., 2000, p.24). However, in 2005, Komarek et al. did control for eruption of teeth and reported no difference in decay between children living in Belgium receiving fluoride supplements (and those who weren't) that was relatable to fluoride exposure. Just recently, Merilyn Haines, the Director of the newly formed group FAN-Australia (Fluoride Action Network - Australia) found startling statistics buried deep in official research material by ARCPOH (the Australian Research Centre Population Oral Health at the Adelaide Dental School). 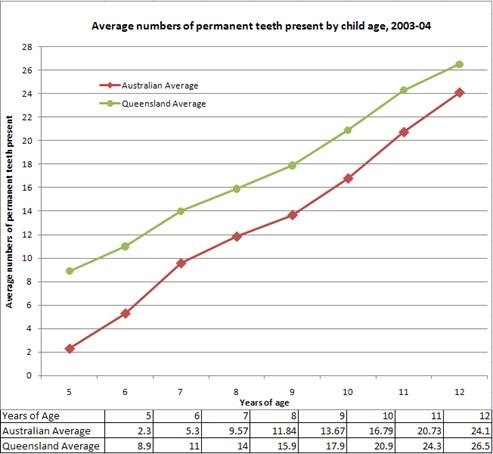 Data obtained through freedom of information by Haines shows that 5 to 12 year old children surveyed in the period 2003-2004 from the largely non-fluoridated state of Queensland (<5% fluoridated before 2009) had significantly more permanent teeth present in their mouths, than did their counterparts in the fluoridated states. This data suggests that there can be a dental age difference of 2 years (see graph below). This adds tremendous weight to the existing evidence that ingested fluoride delays the eruption of teeth, and thus the very slight difference in tooth decay seen between fluoridated and non-fluoridated areas is due to delayed tooth eruption, not genuine prevention of tooth decay. Our acknowledgment and gratitude herein is given to Fluoride Action Network - United States, and Fluoride Action Network - Australia, for their kind scientific support and hard work towards furthering awareness about water fluoridation's relationship to delayed tooth eruption.